When we tell the whole wide world "we're one"
Are you looking for a Romantic Valeintine Day Flower for a very special love in your life? New series of Mays Valentine's Day Flower and Gift for 2019 has released. You can find lots of Valentine's Day flower and gift idea from us. Please place order as early as possible because Valentine's Day is overleap with Lunar New Year that will cause the tight supply of fresh flower. We sincerely encourage you to place your order as early as possible early to save money and time. This also guarantees your flower delivery. Pick your Valentine's day flower at Yau Ma Tei MTR can get $100 discount except special discount! 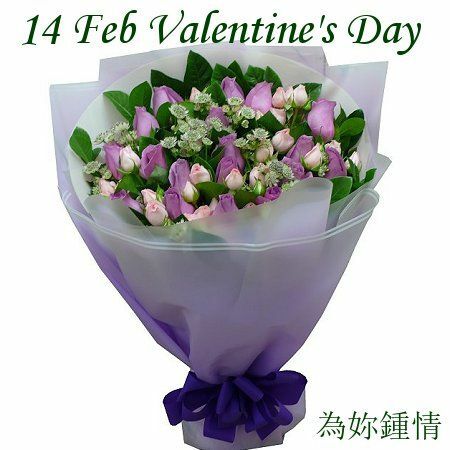 During 11-15th Feb, we only accept order for valentine's day flower. Please select delivery date and click the right category before viewing the Valentine's Day flower. Please order online which is easy and fast. Contact us by email and must check email. Please settle the payment right after order so as to avoid delay of delivery. Guarantee Delivery. If you have made the Bank Transfer, please remember to notify us your order number for payment confirmation. There is no specify time delivery on 14th Feb.
One time delivery charge has included, delivery charge will apply to remote area as village house, villa, airport and re-delivery. No flower delivery to outside Hong Kong Island. Please provide us the receiver phone number that is for in case purpose. We will avoid contacting the receiver before the flower delivery. Please settle the payment after order placement so that your flower delivery can be scheduled in advance to avoid delay. We will confirm your flower delivery either by email or by phone. If you cannot receive the confirmation, please contact us by email. Only accept one time change of card message. For order cancellation, please notify us by Email. Cancellation before 7 Feb will be subject to a 20% handling fee, cancellation between 8-11 Feb, 50% handling fee will be charged. Cancellation between 12-15 Feb, no refund will be given. If you have any queries, please click here to leave us a message or phone #, we will contact you ASAP. If you want to settle payment now, please click Payment Now or click here. To enhance your Valeintine's day flower and gift, don't forget to include the additional Valentine gifts below. Additional Valentine gift such as Card, Dolls, Red Wine and Flower Vase must be purchased with Valentine's day floral gifts.